While a tsunami will never strike Illinois, the Lake Michigan coast, including Chicago, is subject to the danger presented by a seiche, a sudden, large type of wave that can cause loss of life and property damage. Unlike a tsunami, which is caused by submarine earthquakes shifting the ocean floor, coastal landslides, or a meteor striking the ocean, a seiche (pronounced saysh) is caused by air pressure and wind. When storm fronts move rapidly from across a large body of water such as Lake Michigan, air pressure changes and strong downbursts of wind can form one large wave or a series of large waves. The wave or waves will travel across the lake until the seiche reaches shore, where it can be reflected and travel to the opposite shore. The height of the waves depends on the strength of the wind and air pressure contrasts that form the seiche. The largest seiche on record to strike the Illinois coast of Lake Michigan reached a maximum height of 10 feet, caused lakeshore damage, and drowned eight people. The illustration explains the 1954 seiche (view a larger image). During spring and summer, small seiches with a height of a few inches to 1 foot regularly strike the Illinois shore of Lake Michigan. The National Oceanic and Atmospheric Association issues warnings to Lake Michigan mariners and lakeshore residents when weather conditions favor seiche development. There was no warning for the record-high seiche that struck the Chicago lakeshore at 9:30 a.m. Saturday, June 26, 1954. The seiche approached from the southeast and struck the entire Illinois coast with a wave about 2–4 feet high. Swelling as it approached the North Avenue groin, also called the North Avenue pier, the wave reached a maximum height of 10 feet. Fishermen on the North Avenue pier and piers to the north at the entrance to Montrose Harbor were swept into the lake. Many were rescued, but eight drowned. 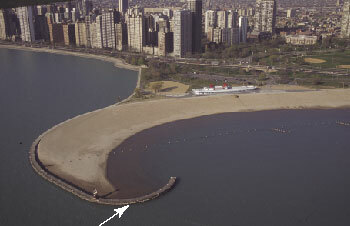 The photograph at bottom right, taken in 2000, shows the groin at North Avenue beach (view a larger image). The arrow indicates the direction from which the seiche approached. The seiche was caused by a severe squall line that crossed southern Lake Michigan a few hours earlier, passing from northwest to southeast. The storm generated wind speeds of up to 60 miles per hour and sent a seiche toward Michigan City, Indiana. A 5.5- to 6-foot wave reached shore there at 8:10 a.m. and was reflected back across southern Lake Michigan, heading northwest toward Chicago. Unlike a tsunami, which can travel across the open ocean at hundreds of miles per hour, a seiche moves much more slowly. It took 80 minutes for the seiche to travel 40 miles from Michigan City to the Chicago lakeshore at North Avenue. That translates into a speed of roughly 30 mph. For more information about seiches, contact M. Chrzastowski or R. Bauer of the ISGS Engineering and Coastal Geology Section. Seiche information is also available online at The Weather Doctor's Weather Almanac: Sloshing The Lakes: The Seiche. Information about how the National Oceanic andAtmospheric Association predicts seiches, with more information about the 1954 seiche, can be found in the PDF file of The Prediction of Surges in the Southern Basin of Lake Michigan, written by Lawrence A. Hughes of the U.S. Weather Bureau, Chicago.